Ted Talbot says the engine is an unlined '5ft 6in 2-4-2 Tank', so the date must be after September 1914. The second vehicle seems to be a Motor Car Truck and the signals do not seem to be LNWR but might be Midland. The word on the front of the tram seems to be 'Riley', so is perhaps advertising Riley cars. Mike Bentley says this is Radcliffe on Trent - he has other pictures at the same location - but he also has a print of this picture which has on the back: LGRP 16912 no. 661 on Leicester - Nuneaton passenger train. This is not Radcliffe-on-Trent which did not have staggered platforms, and I do not think the Nottingham trams went out so far east. LGRP records give it as a Leicester-Nuneaton train near Leicester, one of H.L. Salmon's photos. I think this is the station at Welford Road which closed in 1918 (picture around 1922). There was certainly a skew bridge at the north end, with Knighton Tunnel behind the photographer. It would tie in with the first thought of Midland signals, and would certainly have been on a Leicester tram route. I am reasonably sure that this is on the Midland main line at Leicester, heading south a little way from the Midland station. Mike Bentley gives the LGRP number as 16912 and an LGRP list shows this as featuring no. 661 on a Leicester to Nuneaton train (made up of 4-wheel stock) at Leicester. The LNWR Society doesn't have a copy of the LGRP print but it does have the next two in sequence and both are at Leicester, although a little further along the line. The full answer to the mystery comes from Brian Radford's book Midland Line Memories. On page 103 there is a picture of a Midland train at exactly the same spot. The train will soon enter Knighton Tunnel. The platform in the left foreground is a puzzle in that it doesn't look like the end of the Midland station at Leicester. However, a few pages later, the book explains about that too. It seems that the LNWR built its own ticket platform at Welford Road, where LNWR trains bound for Leicester used to stop briefly to allow staff to collect passengers' tickets. In later years, passengers were allowed to alight there (presumably when the LNWR no longer collected the tickets during the journey). Brian Radford says that trains only called on Wednesdays and Saturdays and, since no platform had been built for trains leaving Leicester, passengers from Leicester to Nuneaton could never board there. According to the book, the platform was closed completely on February 6th 1918. I have looked in the LNWR 1906 WTT and there is a line in the 'South Leicestershire Branch' timetable which shows 'Welford Road' along with a note about Nuneaton to Leicester trains stopping there on Wednesdays and Saturdays for passengers attending Leicester cattle market. There it is - an LNWR station which I never knew existed. So the photograph is at Leicester Welford Road! The signals are interesting, too, for someone who knows less than he should about the Midland. At first glance I noticed the back of the Home signal which the train had just passed and saw the usual black vertical stripe whereas I had though that the Midland used a black roundel - that reinforced the opinion that the train was on the GNR. Further reading showed my ignorance - the Midland ceased to paint roundels on its signals in 1906 and by 1911 nearly all had a vertical stripe. Congratulations to Norman on brilliant detective work in solving the location of this picture. But what about the train? Surely with such a long train and such an assortment of stock it cannot be a normal Leicester-Nuneaton local? Well done indeed to Norman. I agree with Ted that this doesn't look like a normal local train. The main train looks like a close-coupled set, but although they are foreshortened by the camera they somehow don't look LNWR. The third vehicle (first of the set) looks to be six-wheeled (or even four-wheeled) and LNWR stock of that type would have had ogees which this doesn't. It also has a waist panel which the LNWR only introduced much later with Toplight stock. By the time the first elliptical roof van was in service I doubt whether any LNWR sets still retained continuous lower steps, which also suggests that they are "foreign". What could they be? GNR would presumably have been teak all over, Midland dark red all over. They look GWR-ish, but not at Leicester surely? The second vehicle is a lovely LNWR Motor Car Van, carrying very large lettering to that effect. Could this be a special military train or would that have carried a different headcode? If the carriages are not LNW perhaps Great Central? I would suggest that the location is passing the old Cattle Dock platforms south of Leicester Midland. I wonder if the stock is ex-North London. I have a different Salmon view of a Leicester-Nuneaton which is mainly made up of NLR stock with the double continuous footboards. 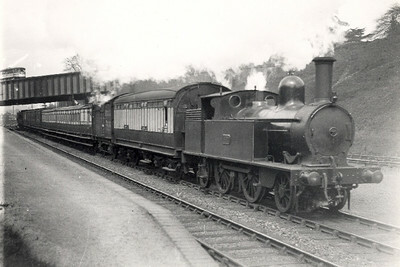 A further view has a lengthy train of mixed stock including a slip coach, so long trains were perhaps not unusual on this service. I do not think this could be the cattle dock as the platform we are looking at is on the west of the line while the Midland Railway System Maps show the dock on the east side. I am sure Welford Road is correct. This is a Leicester - Nuneaton train and the platform is the one which served Leicester Cattle Market, between Aylestone Road and Welford Road. The bridge in the background is the one carrying Welford Road across the Midland main line. The tram is identifiable as a Leicester open balcony one from the slightly domed roof. It is very similar to no.76 which is on display at the National Tramway Museum in Crich. The photo DEFINITELY shows a Leicester Corporation tramcar on the railway bridge. If you look at the booklet Great British Tramway Networks only Leicester had trams looking like the one on your photo, which has side windows covering the side of the upper balcony but not fully round it. They were later fully enclosed cars. With regard to the above the Leicester Rugby Football Club Ground is at Welford Road and this was opened around 1900 when the club founded in 1880 moved from their first ground at Belgrave Cricket Club. The club was and still is well supported with gates of over 10000 a regular feature. There was an international played at Welford Road in 1902 and a touring side from South Africa played there in 1906 as well as the All Blacks in 1904 which gives some idea of the importance of the ground. It is possible that the ticket platform station was opened on Saturdays for the benefit of rugby supporters from the Nuneaton / Hinckley direction. I am not sure if the Cattle Market opened on Saturdays although this is a possibility. I stumbled across this photograph after noticing a bricked-up arch (whilst travelling from Loughborough to St.Pancras) which would have been on the far side of the bridge to the left hand side of the photo. A map of old Leicester shows a siding into the old Leicester Cattle market. The Leicester Chronicler states that "at one time, a siding ran from the main line near London Road Railway Station into the Cattle Market so that livestock could be transported by rail." Nobody has commented on John Alsop's suggestion 18 months ago that this shows ex-NLR stock. I think he is correct. We know that some NLR carriages did receive LNWR livery, so presumably this is one of those set trains. A handful of NLR engines were transferred into LNWR stock before the full amalgamation, so were some NLR carriages transferred also? Perhaps when the Wolverton-built NLR stock came into service they became surplus to requirements? For carriage stock see comments posted for Mystery Photo No.78. The NLR stock became redundant mostly because of the severe decline in patronage as a result of trams, then buses. The NLR Chalk Farm (latterly Willesden) - Broad Street service was discontinued after December 31st 1916. The service on the Poplar and Blackwall line was also hard hit after WW1 by bus competition.